As the popularity of longboards is increasing, so are the variations in longboards. Finding a quality longboard is hard. You might need a little help to find one that best matches your necessities. So, should you check out a few reviews of some top-notch longboards? I think you should! I won’t exaggerate the things and come directly to the point. Below you’ll find the reviews of some of the best longboard for sliding and a small buying guide for your ease to find a perfect longboard. The item is available in different graphic works. The first impression that you get from the Playshion 39 Inch drop through longboard is that it has a series of variation in the graphics of the longboards. If I had one word to describe this longboard, that word would be ‘incredible!’ You won’t find such a good quality longboard in the price range it comes in. less distance between the deck and the ground. Also, this board is symmetrical. So, the center of gravity gets lower, and after that, you can control the board very smoothly. The deck can endure 250 lbs of weight. It’s a sturdy one. You get the sturdiness of this deck combined with controlled flex. The trucks are only 7-inch long. The wheels are big with a diameter of 70mm. The wheels, trucks, and the bearings combine their performances, and you get an enjoyable ride. They give you a smooth movement of the board and also create enough friction for controlling speed. These are all made with top quality material and don’t leave any room for disappointment. The high ratings of this cruiser longboard on online marketplaces indicate the excellence of this item. So, your rides get more enjoyable. You can enjoy high-speed or low-speed easy gripping. Whatever you want. On top of that, you get extreme stability and one of the best longboard for sliding. 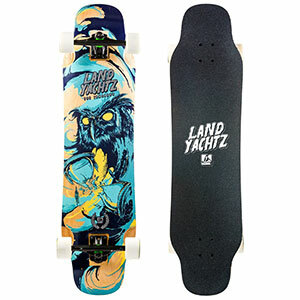 So, we have the Landyachtz Wolf Shark now! This longboard is no less than the previous items that we reviewed. It comes at a high rate, but the materials of the longboard are worth the cost. This longboard gives you ample scope to do freestyle, carving, cruising and many more! I won’t say this one is a deal-breaker, but it has got its popularity with the excellence of performance. Mak your longboarding more enjoyable with this impressive piece of a longboard! This longboard has vibrant graphics which grabs the attention at first. The w-concave shape is also a charm. This shape helps you to feel more secure while standing on the deck. The concave shape holds your weight and helps make the cruising easier. While you slide with this longboard, this high concave design doesn’t let you feel your weight and makes controlling the board simple! While we always look for longboards with more extended decks, the boards with a short deck have their perks. The short decks are easy to try new moves and tricks with. The center of gravity stays near your feet, and that makes cruising more comfortable. This longboard is a bit expensive than the others we reviewed. On taking a look at the construction and the materials, I feel that the price is standard. They have used the top quality materials in building these longboards. So, why not spend some extra cash to get at better longboarding! The OS 780 grip tape helps the user to stand steadily on the deck. 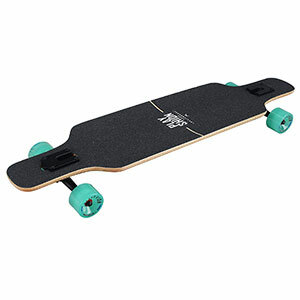 The Rimable Freestyle Topmount Longboard is another much-praised item. This item comes at the cheapest rate among the longboard we reviewed here. The price tag made us think twice about its quality, but when we used this board, all our confusions went away. This one is a charm undoubtedly. Do you want something not too expensive for your beginner longboarding? Look nowhere and buy this one, and you’ll not regret the decision. This item features a 9-ply maple wood deck which is robust and secure. If you touch the deck, you’ll feel the sleekness of the laminated wood. The colors are magnificent. They won’t go away with the course of using this longboard. The artworks are also lovely. The top mount aluminum trucks are 7 inches in length. These trucks make the board move steadily. The item is easy to maneuver. You can slide your way to anywhere with high or low-speed. You can use this longboard in all weather conditions, and for multi-functions. Cruising, freestyle, sliding, carving, etc. are more fascinating with this longboard. Rimable is a company that never compromises with the quality of the materials. The 70x51mm wheels of the Rimable Freestyle Top mount Longboard are smooth, yet provide sufficient friction. Thus, on a downhill, controlling speed and halting any time won’t be dangerous with this board. Sudden turns won’t make you fall off the deck because the wheels create enough friction with the ground. Hence, touring become safer than before. Words won’t be adequate to describe the Rimable Freestyle Longboard. This one is the alternate name of awesome longboarding for me. The deck is 39 inches long and 9.75 inches wide. The deck is made of Canadian 8-ply Maple wood. The wheel’s diameter is 63 mm. It’s time for another item from the Landyachtz. This longboard is the Complete Tomahawk which is 39 inches long. Having a standard length, this longboard is pretty cool to play with. You can also ride for commuting, freestyle, cruising and much more with this longboard. Though the cost is a bit higher than the others, this longboard has still got immense popularity due to its functions. When it comes to the deck of the Landyachtz Tomahawk, I get spellbound. There’s a wild owl graphics on the deck which impresses almost everyone. This deck is everything to make you feel the uniqueness of this longboard when you’re with your squad. The deck is of standard size and shape. The medium W concave shape holds your feet securely when you’re standing on the deck. If you’re a beginner, you won’t feel safer on any other longboard than this. The wheels are smooth, and still, give you enough friction to move freely on the streets. Though a few people complained that the moving doesn’t go very smooth, we didn’t face any such inconvenience while we tried out this longboard. In fact, the ABEC 7 rated bearings keep the wheels aligned all the time. So, the skating becomes smooth and fast. The item is very stiff and stable. It won’t flex much because of the rigid construction. However, it offers sufficient flex to have a smooth ride and perform the tricks. The mellow drop down design is breathtaking. This feature gives you the feeling of riding on a drop-through longboard while the mellowness provides you all the facilities to perform flat-ground tricks and many more. This item might be a bit costly, but if you take a look at the features, you’ll see that the price is legitimate for such excellence. I think this one is a high-end longboard for beginner-level skaters. This one is a very decent longboard. It has the qualities to make your touring safe and pleasant. A bit pricey, but the performance of this longboard is worth the money. The last item in our review list is the Comet Grease Hammer Complete Longboard. This one is pretty amazing because of its long-lasting nature. It’ll be your perfect longboard for many years. The longboard’s deck is of standard size. It has colorful graphics on the deck. The artworks are permanent. They are transfer-proof and won’t fade away with time. 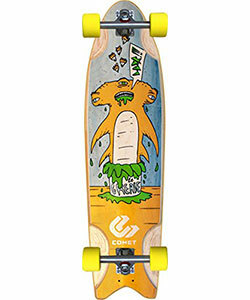 The 10-ply maple wood construction is the fundamental point of admiration of this longboard. The sleek finish gives it a more sophisticated look. The deck is very durable because of the materials. If you want a longboard that’ll serve you a lifetime, the Comet Grease will be the best choice for you. The trucks, wheels and the bearings are also made of first-rate materials. The wheels have a smooth surface, yet they can create abrasion when you try to halt suddenly. The deck stays very low to the ground. So, you get sufficient stability and the feeling of safety from this longboard. This longboard is the perfect for sliding which you can use as dancing longboarding also. Whatever the weather type is, you can step out with this longboard and start skating here and there. Don’t worry about the safety of the board, as it is weather-resistant. This versatile longboard is appropriate for a beginner as well as an advanced-level skater. Kids to adults, everyone can use this longboard without the worry of any risk. The Comet Grease Hammer Longboard has got much popular with people due to its robustness. The construction itself speaks for this item. It’s certainly an item that should be tried out. The building material of a thing has a direct effect on the strength and durability of it. The longboards’ material is mostly maple. Maple gives the decks enough sturdiness and lasts long. You’ll find bamboo and carbon fiber longboards in the market. These two elements are getting favorite day by day. Both of these make the decks very lightweight. While bamboo longboards are thinner than maple ones, they can also flex more beautifully. The carbon fiber longboards are pretty cool too. Though carbon fiber is an expensive element, it ensures faster speed with safer skating. This one depends on you. According to your riding style, you have to pick to a specific longboard. Some longboards are versatile. You can do freestyles, carving, cruising, downhill racing, and many more with them. However, some are only designed for a particular function. So, you’ve to know your riding style and pick one according to that. There are many variations in a longboard deck’s type and shape. There is the top mount, drop through, drop deck, and double drop decks. The shapes of them include concave, w concave, kicktail, wheel cut outs, etc. Every form and types have specific advantages. The wheels of a longboard have a significant impact on the performance of it. The shape, diameter, and durometer of the wheels affect your skating. Round shaped wheels are the most popular. There are rectangularly shaped wheels too. Nevertheless, round shaped wheels are preferable because they go the fastest. The diameter of the wheels can vary from 55 to 75 mm. If the wheels are at least 60+ mm in diameter, you’ll get high-speed without any trouble. The durometer is the measurement of the hardness of a wheel. If the durometer is less than 60a, the wheels will be too soft. Softer wheels cannot produce high-speeds. They cannot create enough friction on the ground and move in fast speed. Also, controlling the speed of the longboard is too tough when the wheels are much soft. Wheels that range from 70a to 90a are perfect for everyday activities. They are hard enough to give both high and low-speeds as per need. Bearings make the wheel spin. There are bearing ratings that indicate the spinning capability of wheels. While reading the descriptions of a longboard, you’ll see that the bearings are ABEC 5 to ABEC 12 rated. There are much or less than this quantity also. The higher the rating, the faster the wheel spins. So, if you want fast speed, choose a longboard with a higher ABEC rating. ABEC 7+ will provide sufficient speed for downhill racing and cruising. Keep one thing in mind that, the bearings need regular maintenance. Once you buy a longboard, it’s your responsibility to take care of it. downhill and sliding are dangerous longboarding riding style. its can be accident. While longboarding, never lose your attention anywhere. Stay safe and practice your tricks carefully. Don’t forget to wear safety gears. When you think about buying a longboard, you’ve to decide on purchasing safety gears for that too. You need a helmet, wrist guards, knee pads, elbow pads, and shoes. Don’t show negligence towards these. These things will ensure you safe skating sessions. Let’s take a look at some questions that arise when you decide to buy the best longboards for sliding. Q: What longboard length should I get for sliding? ​The length of a longboard varies from 33 to 54 inches. Buy one that has a deck of 39 to 42 inches, That is the suitable size for sliding. Q: How do I buy a sliding longboard also can high speed running? ​To buy a high-speed longboard which has wheels of 70mm+ diameter, and 75a+ durometer, and bearings of ABEC 7+ rating will provide high-speed. So, this was all about sliding longboard buying guide. Now you’ve got it all in one place. every single tip you need to grab your next longboard. Well you don’t have to wait anymore. Simply grab one of our top rated reviewed. I’m confident that you’d have found a likable longboard from this review. All these longboards are tested and liked by us. All these longboards have gained much praise from people. So, gather your guts and try one out. I assure you that you won’t get any disappointment. I hope you get more enjoyable longboarding experiences.